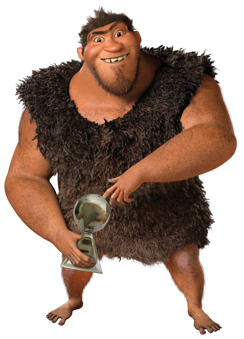 National Fatherhood Initiative (NFI) will bestow its Fatherhood Award™ on “Grug” -- the star of the upcoming 20th Century Fox/DreamWorks Animation feature, The Croods -- at a pre-screening of the film in New York City today. The Croods follows a prehistoric family on a road trip through dangerous and fantastical terrain as they seek a new home. Throughout the adventure, Grug protects his family from various dangers, being the first line of defense in this new world as The Croods embark on their first family road trip. He also works through the challenges of raising his teenage daughter, Eep, and develops an especially strong bond with her. Upon hearing about his Fatherhood Award™, Grug said, "I'm very humbled by this honor and am deeply grateful. Now everyone get back in the cave where it's safe!" "It was an honor to play the paternal Grug, because of his commitment to his children. I celebrate all fathers who remain devoted to spending time with their sons and daughters, to just be there for them," said Nicolas Cage. The Award will be presented at a pre-screening hosted by The Moms (Denise Albert and Melissa Musen Gerstein), the multi-platform lifestyle brand and event company. Since Grug will be unable to accept the award in person, directors Kirk De Micco and Chris Sanders will accept on his behalf. The screening begins at 4 p.m. EDT at AMC Loews Lincoln Square Cinemas, to be followed by the Award presentation and a celebrity Q&A with Catherine Keener, De Micco, and Sanders. The presentation of the Fatherhood Award™ kicks off a campaign from NFI to promote the pro-fatherhood themes and messages in The Croods. Leading up to its nationwide release date of March 22, NFI will employ its social media properties to use teachable moments from the film to inspire dads and generate enthusiasm for the film. Follow the campaign here on the blog, on Facebook and on Twitter @TheFatherFactor.